It's been 25 years since Sonic The Hedgehog first started grabbing rings and battling Doctor Robotnik, and to celebrate the occasion, ESP Japan has designed four 25th Anniversary models for Sega's most famous creation. Based on models built for Sonic composer Jun Senoue, the guitars feature Sonic and his not-so-popular rival Shadow (we'd have rather seen Knuckles, or even Tails, but hey ho), and are available in high-performance and standard models. Built for speed, the ESP SN-25th Sonic The Hedgehog Guitar-II offers an alder body with bolt-on maple neck and ebony fingerboard, plus a Floyd Rose 1000 vibrato, and Seymour Duncan JB and SSL-4 pickups. It's the same spec for Shadow's offering, although it only packs a single Seymour Duncan JB humbucker at the bridge. Nonetheless, both guitars come with a certificate, pick set, musical score, "special" polishing cloth and gigbag. ESP's high-performance Sonic-II and Shadow-II, meanwhile, up the ante with Jescar frets, custom inlays, Gotoh tuners and sneaker-esque headstocks. The Sonic-II adds a Schecter Monstertone single coil to the neck, while Shadow-II features a red-button kill switch. Both guitars come with custom hardcases. 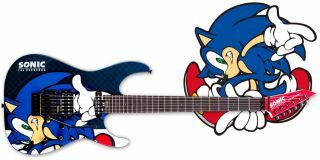 We're not sure whether any of Sonic's guitars will make it overseas, but buying one will set you back ¥165,000 (£1,194/$1,581) for the standard models, and an almighty ¥645,000 (£4,664/£6,181) for the high-performance versions.